Back in China for the eclipse of the century, that of July 22, 2009 and again a great trip… At the end of monsoon, the place of observation is very difficult to choose. The weather statistics make us prefer the area near Shanghai. Very wisely, we provided a bus to have a certain latitude of mobility to adjust our position at the last moment. The day before the eclipse, a violent storm broke out as the announced schedule. It is imperative to move towards the southwest and 300 km. away. A cloud deprives us of the sunrise but ascending into heaven, the sun finally appears in an area spared…. The lights dim and the lighting of the sodium lighting of the highway rest area where we were was depriving us of the special ambiance of this characteristic pale light before totality. Planets and stars are invisible. In contrast, the 2nd and 3rd contacts are beautiful, gently attenuated by the clouds. I have seen without the filter L80x20 the last ray of light and fabulous appearance of the pink chromosphere. Only very low crown pierces and irradiates the nearby clouds, showing a certain luminous flows. It is almost impossible to guess the general form and extensions of various plumes, drowning, tangled and modifying themselves to suit the rapidly changing clouds. At the maximum, the urge to stop everything takes me to this sketch… But then there is a magnificent chromosphere, a protuberance which only extends to the approach of the 3rd contact giving me the urge to continue this work and transcribe this unusual vision. Diamonds are beautiful, followed by a string of fine grains of Bailly, easy to follow without a filter for several seconds. Although at the time, I felt some disappointment at this show ruined by clouds, I savored the benefit-post, glad to have been among the privileged few to have seen in its entirety. Very nice sketch! It’s fantastic! 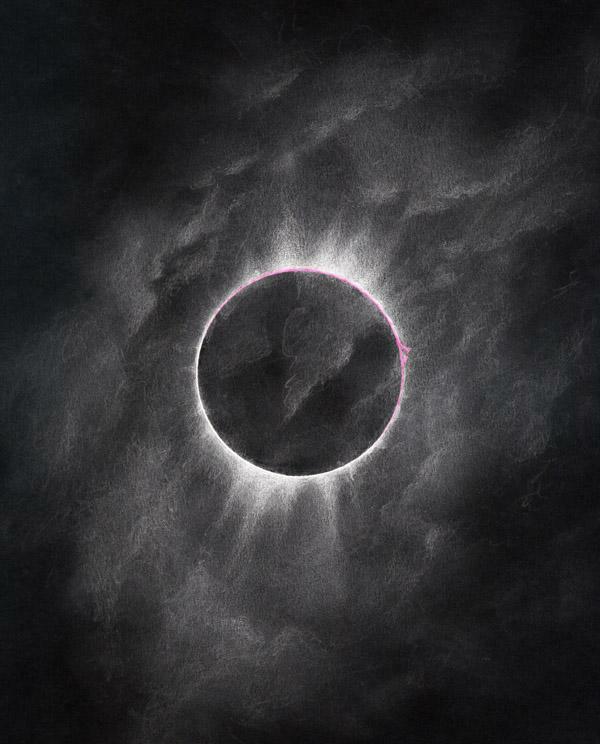 This sketch (and description) is the best I’ve ever seen of a total eclipse of the Sun. How did you make this incredible drawing? Hey I love this sketch, and my band was wondering if we could do an edit of this artwork for the lyric pamphlet in our album. We needed an eclipse piece and my sketch wasn’t nearly good enough (lol), so we were wondering if we could use yours? We’re not signed and we’re just making this to distribute to friends and family, not producing more than 500 copies, and we’ll make sure to credit you and everything. anyways, if you could consider our proposal, that would be great. thanks!